This DVD/CD combination introduces the viewer to the proper sequence in performing a complete oral and dental examination. A pre-sedation evaluation is described followed by a detailed description of equipment necessary to perform the examination. Techniques used to perform a safe and complete intra-oral examination are described and illustrated. The author’s preferred technique for floating teeth is illustrated in the live horse and for a better view of the exact procedure the technique is repeated on an equine skull. 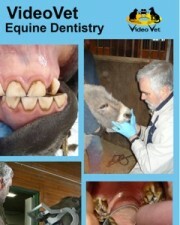 This DVD is a must for practicing veterinarians that perform dental exams and procedures on a relatively routine basis.